The Internet-of-Things revolution is on! Every day new consumer IoT products make it to the marketplace, to make our homes smart, automate some of our daily tasks, manage our health and sleep, make us safer, etc. Not to say anything about a whole other category of IoT devices intended for industry 4.0 applications. With the exponential growth of an IoT/connected ecosystem in our lives, there is also an increasing growth in complexity. The Man-Machine interface, which not long ago basically meant how we interfaced with desktop and laptop computers, now includes not only our smartphones and tablets but a deluge of voice and app-operated devices. And remember, not everyone trying to make the transition to a connected, machine-happy world is a millennial or Generation Z’er. If this technology wave is to have any success at all, the transition must necessarily move from the early majority of users to the late majority of less tech-savvy, perhaps older and more tech-resistant people among us. The magic intersection between connected consumer electronic devices and human beings (whose evolution has been a little slower than the pace of technology evolution) will be somewhat complicated to say the least, and smart vendors will have to manage it by accompanying their users through the transition. 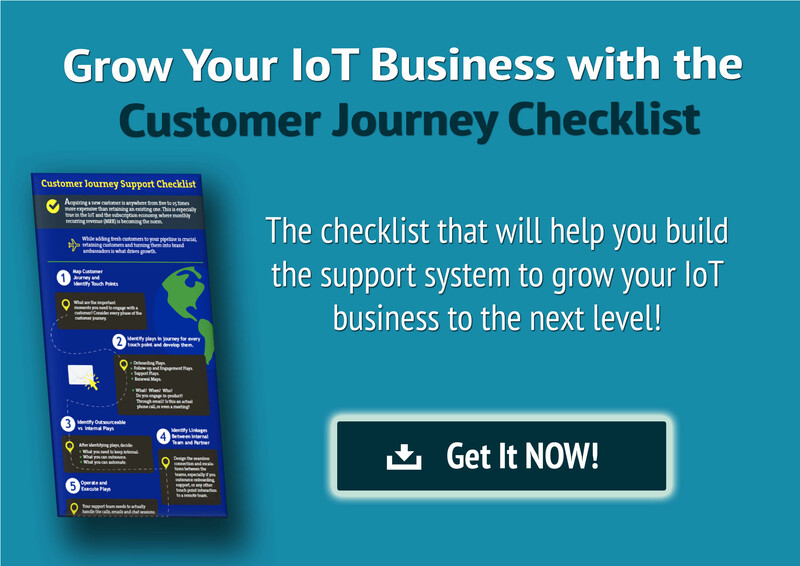 The biggest challenge for consumer IoT companies is not selling their devices – rather it is to make sure their customers derive value from them, keep using them and stay engaged with the company by ensuring a happy, successful ownership experience. And the main way we have to do that is by using data. 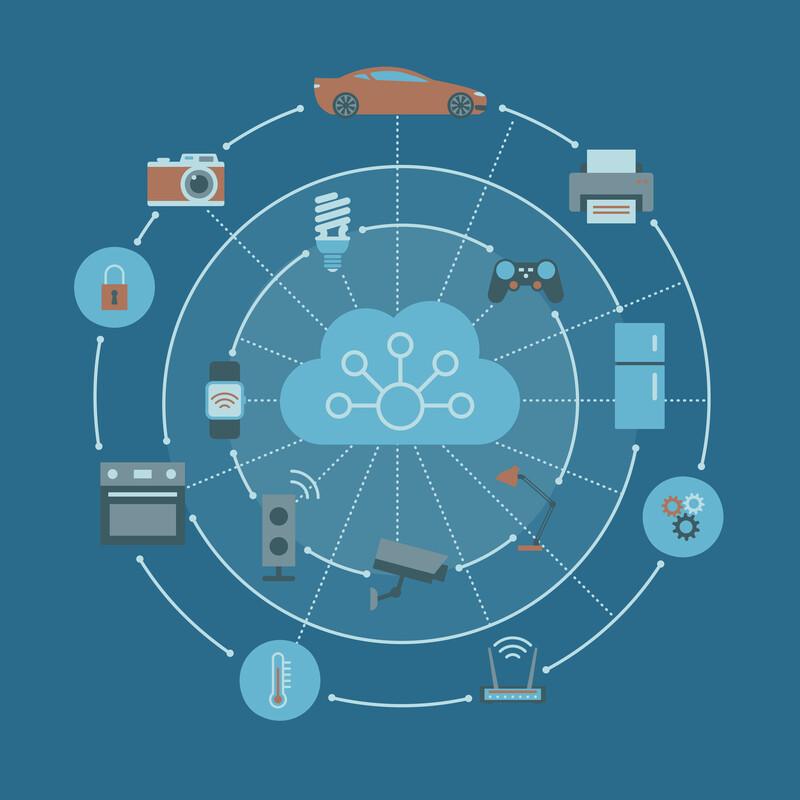 Because these are connected devices, and we live in a connected world, data about a customer’s experience with a product is pervasive. You can use this data to your advantage, to ensure your customers not only have a fantastic experience throughout their lifecycle with you (the ‘customer journey’), but also to ensure they become raving fans and ultimately come back to you for more solutions. You can start by tapping into all the data the rest of your systems are already producing about your customers, including what they bought, when, with what, for how long, and about every customer interaction with your company at different points of the journey. 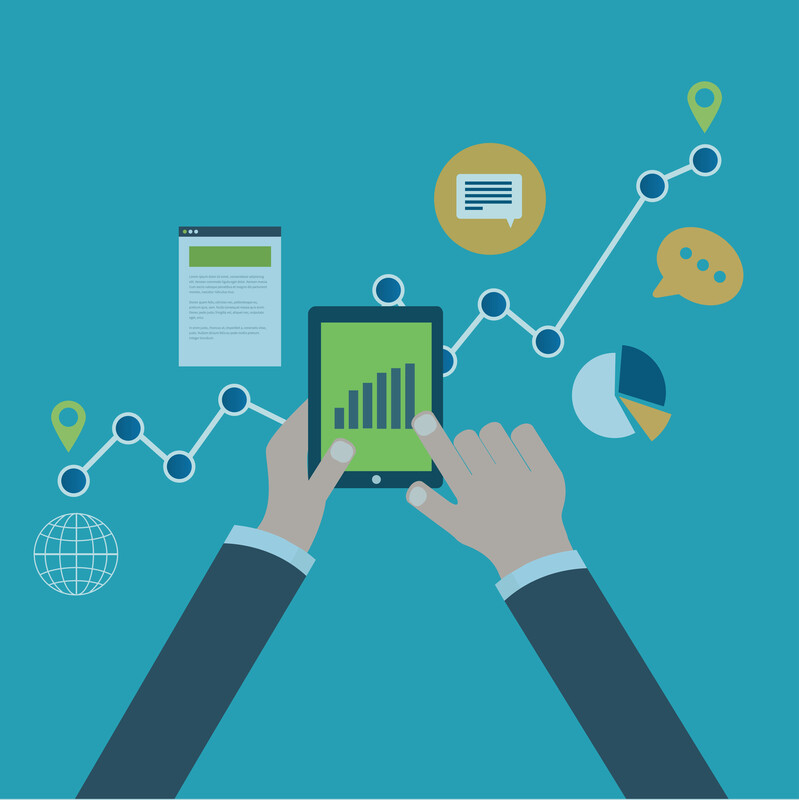 In this article we’re going to discuss four steps to ensuring you optimize your customer’s journey with data. We’ll discuss your goals for customer journey optimization, which customer touch points in that journey you need to focus on, the sources of data to rely on, as well as the data model you can build to help you optimize that journey. The customer journey is the lifecycle of a customer with your company or with your product, from when you first provide pre-sales information to that customer, to the time when you’re trying to either renew a subscription or upgrade the customer to some other product. Everything that happens from point A, when the customer first acquires your product (or even when they’re still inquiring about it, as mentioned above), to point Z, is the customer journey. Provide your company with a way to expand your customer relationships from a value and revenue standpoint. To summarize, I’m talking about making sure the initial purchase of your product is not the last interaction with your customer, but is rather the first interaction in a long, fruitful and profitable relationship with your customer. Which Customer Touch Points Should You Focus On? There are key points along your customer’s journey you need to optimize to ensure a relationship that not only moves forward, but also results in an expanded relationship. Disclaimer: please remember we are talking about a technology/consumer electronics product. The customer journey for other types of products and/or customers may look completely different. For the sake of simplicity, we’ll group the experience of purchasing the product and first setting it up into one phase of the journey, although you could always separate it into different touch-points. In the case of many of the consumer IoT products we have referred to, we are talking about a DIY (Do-It-Yourself) experience. That said, many of your customers will require assistance, whether that is from online help guides, in-product guides or live support. During the initial product purchase and product on-boxing and setup, how can you optimize their on-boarding experience? 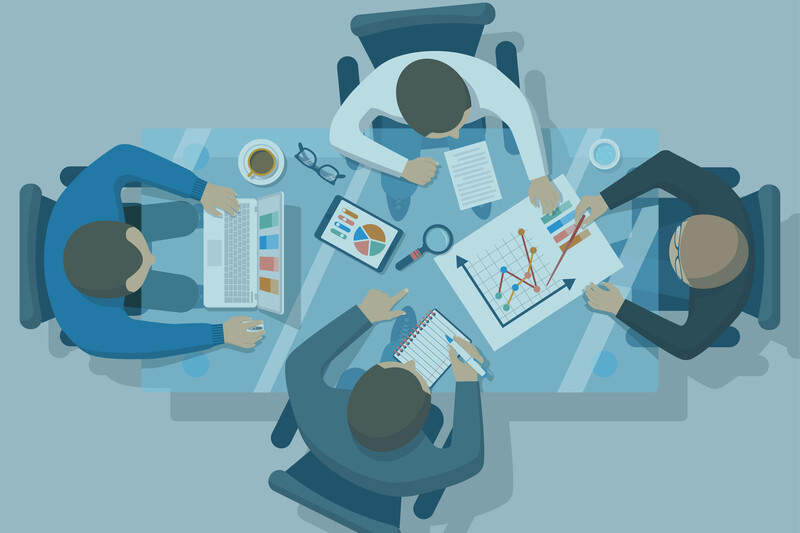 How can you reduce the customer’s effort in setting up your product? Are you providing on-boarding emails and videos? Are your customers consuming this content? What happens when they do call? What are they calling about? How is that going? How often are they calling and how is that impacting their experience? Are they able to configure the product and the mobile app that controls it on their own? Which parts do they struggle with? These are all questions you may try to answer with data. Once you have some insights, you can decide what actions to take to optimize those particular touch-points to meet your goals. Once a product has been setup in the customer’s home, car, wrist or whatever the case may be, the first 90 days are a critical period, as the experience of your customers with your product AND company can make or break the relationship. You need to ensure each 30-day increment is optimized. During the first 30 days, your customer might still be trying to solve certain product setup issues and learn the basic product functions. The next 30 days she might be interested in connecting it to other devices, such as Alexa or Google Home. The following 30 days she might be trying out more advanced functionalities, such as interpreting and using your product’s analytics. How are you handling this usage growth curve and challenges along the way? Are you providing tools, videos, and helpful live assistance? How can you avoid customer defection when users hit various roadblocks? How can you ensure your interactions with them create delight and loyalty? Then, when your customer is at a “mature” stage of usage with your product, what issues typically pop up that can affect their status as a happy – or unhappy – customer? Are they trying to find out more ways to use your product, new use cases? Have whatever issues they have faced been resolved? Or are they ongoing? Are they calling support too frequently? What for? There is a difference between the desired engagement of a customer who calls once in a while as they progress along the learning curve and a frustrated customer who calls frequently because his product keeps failing and he’s not getting the value. How do you make sure that you’re always there and the customer stays engaged? Lastly, towards the end of the customer journey, you will want to identify whether your customer is ready to upgrade, purchase complementary products or throw in the towel. This is another critical touch point and can make the difference between linear or explosive growth for your company. We all know that retaining customers and expanding on those relationships, even for consumer products, is key to sustainable growth. So how can you tell if a customer is prone to upgrade or expand? Conversely, how can you tell is they’re ready to switch to a competitor? What choices can you offer? How do you learn, even from detractors, about what worked and what didn’t? The good news is, you can collect and analyze data through these four critical customer journey stages. In the next section we’ll describe some of the data sources you can tap into to optimize each touch point. So Where Can I Find This Data? There are more than enough sources of data you can use to gain the insights to optimize your customer journey. Your support platform provides a wealth of information. What are your customers calling in about? What product issues come up most often? You can identify product bugs with this data, as well as usability issues. But your support platform can also provide you with customer insights, such as previously unknown or corner use cases and what features your customers wish your product had. The platform you use to manage recurring subscriptions can also provide relevant data points that you will need as part of your overall data model. This includes what plans your customers have chosen, when they renewal dates are, and what upgrades are still available for them. Your e-commerce platform is another source of data, which includes what products your customers have bought and when any accessories bought along with them or at a later time, what generation of product they acquired, product discounts applied, etc. 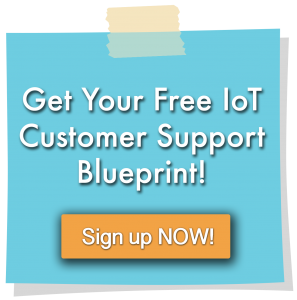 If you’re a consumer IoT company, you can’t afford to actually call your customers, and you’re likely communicating with them at different points of the journey through e-mails messages. Your marketing platform can provide information about who of your customers are opening your e-mails and engaging with the tools you are providing (videos, FAQ links, blog posts, etc. ), and those that aren’t, for example. Your PBX or phone platform can provide a wealth of data too. This will include frequency and type of calls, but also the actual conversation between your support agent and the customer. There are various tools available to transcribe those conversations into text, in order to inform your decision-making regarding your customers’ experiences. Lastly, since we’re talking about connected devices here, your products themselves or the phone apps attached to them will provide valuable data on usage. For example, if it’s a multiple user device such as a camera or a smart lock, how many users or guests use it, and who uses it the most? What times of the day? If it’s a tracker or wearable, what is it telling you about how/when it’s being used? About its settings at the time of a certain event? Same for a connected doorbell cam or a car cam, appliance or any other type of product with embedded sensors. At the end of the day, there are plenty of sources of data, but data by itself isn’t sufficient. We need a data model to help you combine these various data points and make sense of it. This can get pretty technical but you’re a connected device company so I wouldn’t worry. Much like an architectural model, a data model is an approximation of reality, a simulation, if you will, about what combination of data points will help you arrive at a particular decision or insight regarding your customer. It all starts with business questions. Once you’ve identified the basic business questions you are trying to answer and determine whether they can be answered with data, you need to set up the appropriate data model to inform your customer optimization strategy. Actually, you can go fairly low-tech by using your CRM or support platform to build a data matrix that helps you collect your data for all your customers and see patterns or even make decisions, as well as build dashboards and graphs to help you look for insights. Alternatively, you can get into data science territory (probably a must for consumer companies), and leverage tools such as the Crisp-DM methodology and analytics toolsets, to help you identify business question, select the right data for answering those questions, prepare it and combine it and build analytics models that will get you the insights you want to get to. You can get pretty high tech about this or not. It’s up to you. Below you will find an example of a simple data model, which includes a number of data variables used to determine whether a customer is at risk of churning (abandoning the brand) or not, and to what degree. Some of these variables are obtained from the support platform, some from the e-commerce system and yet others from the subscription management platform. Estimating a probability of churning, as well as which variables impact it the most, will provide insight into what actions to take. In the rest of these series, we will delve into the details some more. Again, you can collect and analyze data to help you optimize your customer journey through the four critical stages we described before. For native digital business models, such as IoT and consumer IoT in particular, this is not only most important but also extremely feasible. The more you know and the more roadblocks you are able to remove for your customers and users, the easier their transition to their smart, connected life will be.